It seems the Nissan Leaf in Norway is quite popular as 1000 Nissan Leafs, an electric car, have been sold in the country in just six months. This means the Nissan, while only selling 1000 Nissan Leafs, took almost 2% of the total car market with this innovative electric car. Also the Nissan Leaf become the second best-selling Nissan in Norway and the ninth best-selling passenger car overall in month of February. This demonstrates the positive impact of comprehensive incentives by the government and developed charging infrastructure in Norway. Norway currently has the highest level of support in Europe for electric vehicle purchases with zero Value Added Tax (VAT), no new car tax, free parking, exemption from some tolls and the use of bus lanes in Oslo. "We are very happy to see that the ambition of the Norwegian government has matched our own with strong support for the widespread introduction of electric vehicles.” said Olivier Paturet, General Manager of Zero Emission Strategy at Nissan Europe. On top of these generous incentives by the Norwegian Government, the existing on-street charging infrastructure in Oslo is very well developed. There are approximately 3,500 public charging points in the city Oslo, many of them free to use to the public. 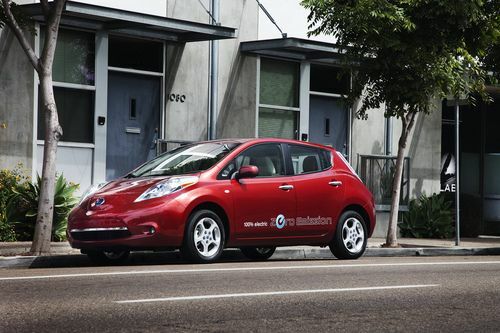 So if you need to “filll-up” your electric car, including a Nissan Leaf, you can do it for free. “The Norwegian package of incentives is unsurpassed and the recharging infrastructure is established and accessible. We can see that Norway is leading the way with its proactive approach to encouraging its citizens to drive electric vehicles. We hope it will continue with the further development and upgrading of the charging infrastructure." added Paturet. The 1000th Nissan Leaf handover took place on April 25th in front of the Ministry of Environment of Norway where the Minister, Bård Vegar Solhjell, handed over the keys to Nils Haugerud, the new owner. Also attending the hand-off was Birger N. Haug the dealer responsible for selling the 1000th Nissan Leaf. Mr. Haug has sold 550 of the 1000 sold so far in Norway, making him one of the largest volume Leaf dealers around the globe. All of the sales so far have come from a select group of dealers, but Nissan is eager to expand in the country. "LEAF has been a success for us and for the nine dealers that started selling the car last year, so it is a natural step for us to open up for sales from other Nissan dealers as well. We are extremely satisfied with our LEAF sales performance in Norway.” said Pål Simonsen, Country Manager for Norway. Norway is a country known to be sensitive to environmental issues and to have ridiculous high gas prices. How high are the gas prices? Let's just say when they say high gas prices, they mean high gas prices! Norway sells gas by the liter, not gallon, and per liter you are looking around $2.30-$2.50 US dollars. Around 4 liters make a gallon, so that means Norwegians pay in the $10 per gallon range! Filling up a tank would cost over $100 easily! So it's not surprising that an electric car, like the Nissan Leaf, would be popular. I am sure the real problem won't be selling electric cars, it will be making enough to meet demand in Norway.